MICHAEL GONZALEZ – TELEPROMPTING AT USS ILLINOIS COMISSIONING CEREMONY. I am aware that I often begin my blog by saying it was an honor… yada yada yada. But, truly, this past weekend I had the distinct honor and privilege to work for the First Lady of the United States, Michelle Obama. 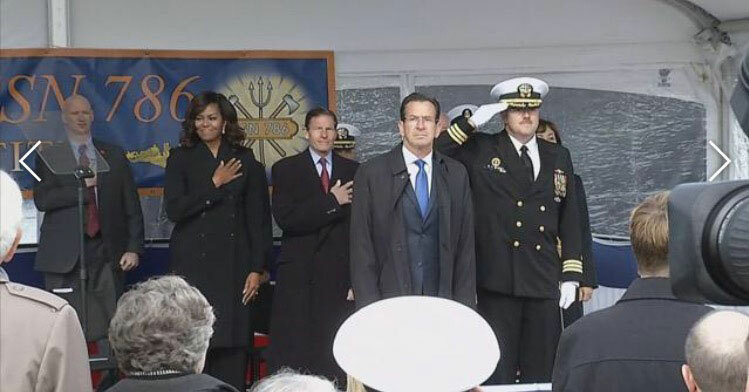 Our First Lady said she was “beyond proud” to take part in a commissioning ceremony for the U.S. Navy attack submarine named for her home state of Illinois. 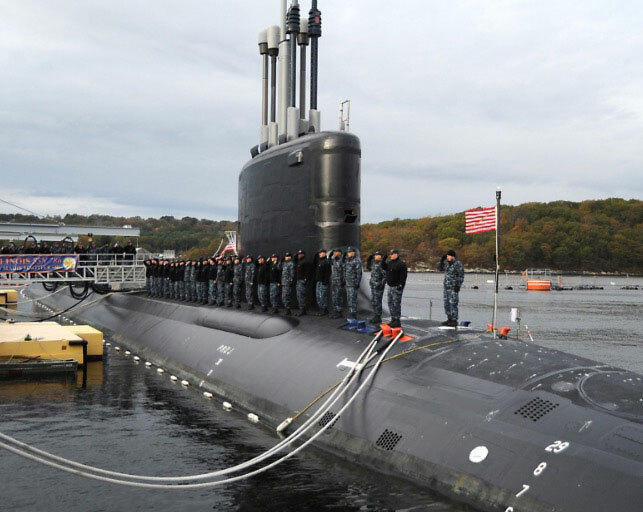 The submarine officially became the USS Illinois, SSN 786, and began active service after the ceremony on Saturday, October 29, 2016 in Groton, Connecticut. This was absolutely a momentous occasion. I humbly tell you that I was a crucial part of the event as the Presidential Teleprompter operator. I was keenly aware that while teleprompting I was in a historic vessel, the most deadly active nuclear submarine ever put out by the U.S. military. Add to that, that Mrs. Obama was following my cues! There were multiple rehearsals for two days straight. Security was intense as you might imagine. Between canine anti-terrorist sniffing agents, sporadic sweeps, and the omnipresent Secret Service – pressure was on. Once cleared, I methodically set up the intricate Presidential Teleprompter unit to the left and right of the podium, center stage for the ceremony. I was unfazed, calm and fully aware that I was being watched. Experience has taught me to appreciate the Secret Service. Their dedication is laudable. Given that the event was held outside certain factors had to be considered. The sun and the reflection on the Teleprompter glass would be problematic. We used ultra bright monitors to counter this. I also spent quite a few hours sourcing sandbags to counterbalance the weight of the Presidential Teleprompter pole. I also had to take into account that it was very windy at the Naval base. It was imperative I think through and execute every fail-safe. Every plug, two-way splitter, power source and cabling was carefully gaffed down. After all the rehearsals and meticulous setup preparation, I was ready for war! 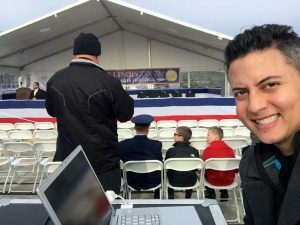 The next day, in 36 degree weather and a high wind chill factor at the Naval Base in Groton, Connecticut, it was go time! The First Lady was clearly happy to be there and warmed up the crowd. “Thank you for giving me the incredible privilege of being associated with you and with your families and with the Illinois for the rest of my life,” she told them. Michelle Obama, who is from Chicago, has, as the First Lady, made supporting military families a high priority for years. “Working with our military community has been the biggest honor of my life,” she said, before going on board and touring the vessel. Mrs. Obama’s speech was met with enthusiastic applause. She is loved and admired by most. I was moved by her genuine interest and passion. She is an extraordinary public speaker! She rivals her husband, Barack Obama. Do you think their daughters feel any pressure? As the event came to an end, I felt an incredible, immediate sense of relief. My small role as the Teleprompter Operator was acknowledged and appreciated. Mission success for the American Movie Company and its professional teleprompting services! 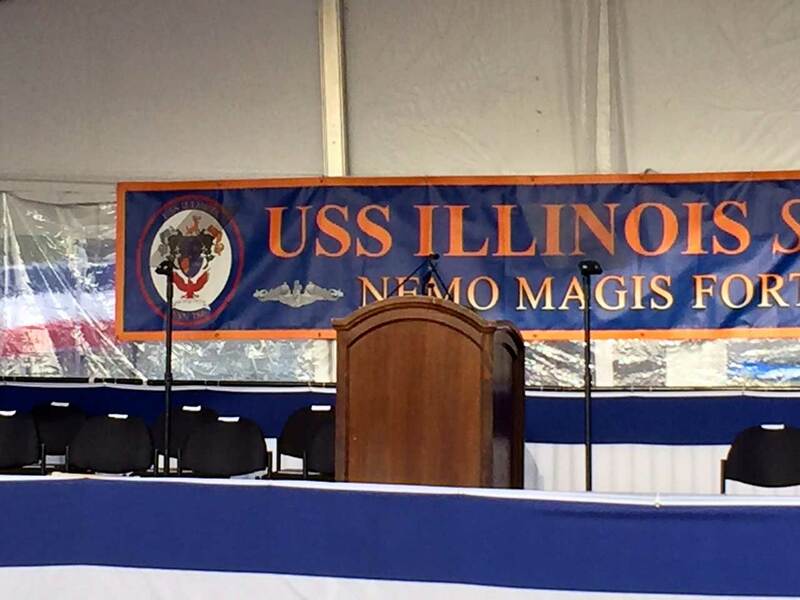 USS ILLINOIS COMMISSIONING CEREMONY – PRESIDENTIAL TELEPROMPTER ALMOST VISIBLE – LOOK AT POLES! By the way, the Latin underneath the submarine’s name, “Nemo Magis Fortiter,” means “none more brave”.